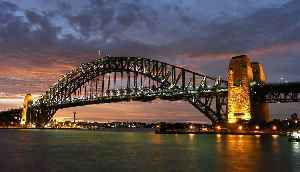 The Sydney Harbour Bridge is a heritage-listed steel through arch bridge across Sydney Harbour that carries rail, vehicular, bicycle, and pedestrian traffic between the Sydney central business district (CBD) and the North Shore. The dramatic view of the bridge, the harbour, and the nearby Sydney Opera House is an iconic image of Sydney, and Australia itself. The bridge is nicknamed "The Coathanger" because of its arch-based design.